Providence St. Joseph Health nurses receive their Bachelor of Science in Nursing at the University of Providence in Great Falls, Mont., a school co-sponsored by the health system. The drive to attain value-based care is reshaping hospital staffing at every level, from hiring to education to teamwork. Clinicians are needed to help manage patients' care, and collect and interpret data, while in general they work to become more efficient. And experts say value-based care and its emphasis on patient satisfaction have fueled skyrocketing demand for health professionals such as registered nurses and advanced practice nurses. “Most patient complaints involving hospital stays involve time in the hospital after surgery, such as being able to access a nurse when needed,” said Mark Heymann, CEO of UniFocus, a workforce performance firm. Consulting firm Mercer expects a shortage of 95,000 nursing assistants and 29,400 nurse practitioners by 2025, according to its workforce strategy and analytics practice. Already, experienced nurses are in high demand at hospitals seeking high patient-satisfaction rates, said Tommye Austin, senior vice president and chief nursing executive at University Health System in San Antonio. In response, Providence St. Joseph and other health systems have forged a “grow your own” strategy to address workforce needs in the age of value-based care. 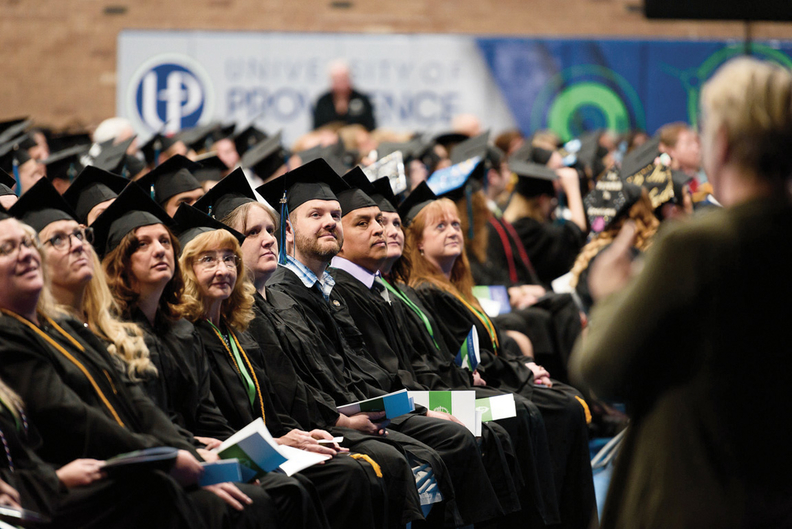 Last year, the University of Providence in Great Falls, Mont., launched its School of Health Professions to meet growing demand for skilled healthcare workers. The university is a ministry of Providence St. Joseph Health and is sponsored by the Catholic Diocese of Great Falls-Billings. The School of Health Professions offers a number of online degree programs at the bachelor's and master's degree levels, as well as post-baccalaureate certificates, including RN to BSN completion; Master of Healthcare Administration; and Master of Science in Infection Prevention and Epidemiology. Susan Salka, CEO of AMN Healthcare, a staffing and workforce company, said more hospitals are tapping into complex, technology-driven tools to attain value-based care. Such tools include outsourced recruitment processes to help attract permanent staff and predictive analytics to improve scheduling. The need for these data-driven solutions has led to “many technology companies popping up all over the place” to assist hospitals, Salka said. Matt Keahey, vice president of operations for the Medxcel healthcare facilities services company, said the relentless changes in healthcare can be dizzying when trying to keep staff up to speed. “The pace at which healthcare is changing has not left a lot of time to think through the unintended consequences of some of the short-term decisions that are being made,” Keahey said. For example, he said, the “systematic outsourcing” of departments reshapes the tone and feeling inside a hospital. Millennials, currently the largest generation in the workforce and carrying a reputation for self-involvement, may be a good thing for the workforce. “Millennials want a better work-life balance,” Heymann said. “They want more time off and they're prepared to spend longer hours at work to get more days off,” which could pay off for everyone in the long run. Julius A. Karash is a freelance writer based in Kansas City, Mo.